From the outside, Jessica Bell’s life looks like an extraordinary success. Editor, teacher, author, and singer/songwriter, Bell has written and published a number of books in different genres including poetry, several novels and writing guides, created her own literary magazine, become a fully-fledged publisher, written a music album, and joined a major band, all in the last decade or so. Success appears to have been effortless for her. 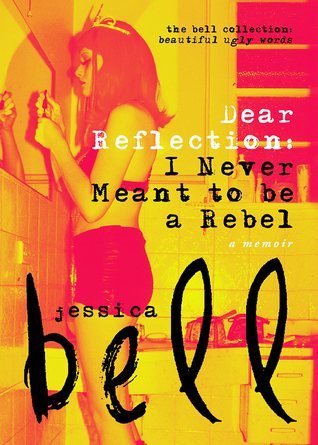 Bell’s memoir Dear Reflection: I Never Meant to be a Rebel shows just how far from effortless that success has been. Bell’s first (and possibly not last) memoir is a well-written, fast paced, and engaging read that chronicles Bell’s extensive struggles with depression, with being the child of two semi-famous gothic musicians, years of coping with her mother’s drug addiction, and the ongoing battle to maintain self-esteem against an inverse of Snow White’s evil queen’s mirror on the wall – the “reflection” of the title. The book is structured chronologically into five parts, each tied to a particular timeframe that moves between age four and thirty five. It is generally progressive but the mirrored reflection remains in the present tense as an uneasy and often malevolent confidante that takes on the role of a character. It is possible to read the reflection as Bell’s alter-ego or the ‘monkey mind’, like an evil twin that must be reckoned with. This ‘reflection’ is represented by an italicised voice that not only receives the chronicle letters, but which continually attempts to undermine Bell’s successes and sense of well-being. The reflection isn’t just Bell’s own self-criticism. It’s also a societal voice that many readers will recognize all too well – the voice of the ‘normative’; the voice of magazine ads and perceptions of ‘should-be’, and it’s clear from the start that the real story here is about the battle between this self-saboteur and the desire to for self-actualisation and happiness. It’s an ongoing battle and one which takes this story from an interesting account to one with universal appeal. The struggle between mother and daughter mirrors the struggle between mirror reflection and real person. Erika Bach’s own attempts to carve out a career while caring for a young daughter and dealing with debilitating pain and mis-diagnosis is like a secondary tale, made even more poignant by Bach’s letter that ends the book. Her role–both as antagonist, and as the most steadfast and constant ally in Bell’s battle for self-identity and creative fulfilment is both harrowing, and affirmative. Throughout the memoir, Bell very deftly weaves in the present, continually testing the past against a revised perception, and creating a slightly meta-fictional quality to the work that is post-modern in its conceits while still sticking closely to the memoir format. Bell’s many ‘lives’ include plenty of rock and roll, love affairs, loss, and even a suicide attempt. The story is bolstered by footnotes, a website full of photos, and lots of musical links to give what is already a powerful read a multimedia impact. Dear Reflection is one of those memoirs that really draws you in and will stay with you long after it’s finished.